School has officially begun, and for most people that means that life kicks into high gear once again. Lesson planning and grading for teachers, late night cram sessions, and endless hours in the library for college students, homework and after school activities abound for the kids, and parents turn into taxi driving-playdate organizing-PTO attending-conference going-sports coaching, super humans. As these busy days grace us with their presence once again, I find myself turning to quick and easy dinner recipes that are both filled with flavor, and on the table in minutes. 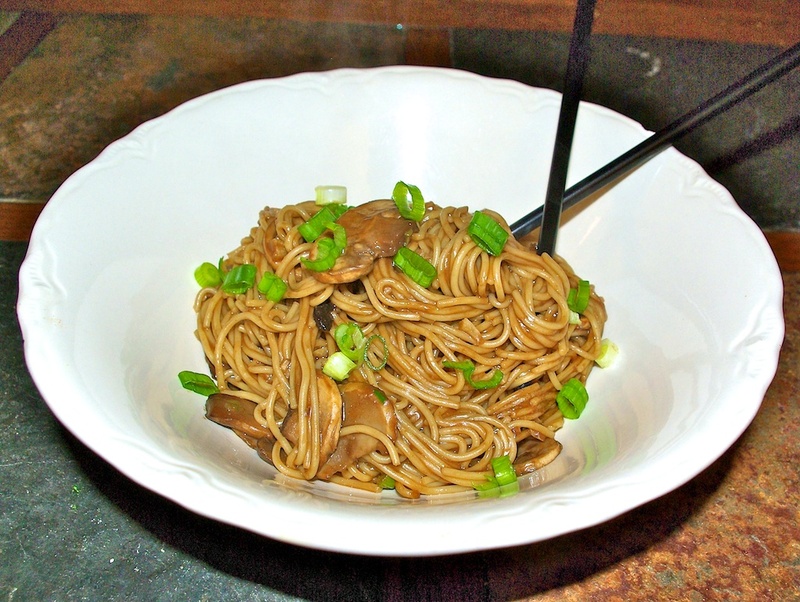 This Peanut Noodle Dish is one of my favorite meals for those random Tuesday nights when there is not enough time to even think about dinner before 8:00 rolls around. It is filled with unique Asian flavors, easily adaptable for meat eaters or vegetarians, and is on the table in less than 20 minutes, what could be better? I hope you enjoy! in a large pot of salted boiling water. Drain. skillet and heat over medium heat. Add sliced mushrooms and sauté until tender. Add garlic for last 30-60 seconds of cooking. sauce, peanut butter, honey, and ginger. Whisk together and bring to a boil. using) and toss to coat evenly. Thank you so much for this recipe. It will be a hit at my house for sure. I just found your blog and wanted to thank you for posting simple, yet yummy recipes. Thank you for taking your time to share your yummy treasures and your talent. Your family is really lucky to have you!